Here are some of the top performances for the week of Nov. 28 to Dec. 3. The sophomore forward was named the Most Valuable Player of the Legacy Tip-Off Classic. Alexander had 19 points in a 67-56 win over Centennial in the championship game. The senior guard had 15 points, four rebounds and four steals in the Diamondbacks’ 62-44 road win over last season’s Sunrise Region runner-up Foothill. The senior wide receiver/linebacker ran for two touchdowns, caught three TD passes and returned an interception for a score to help the Eagles to wins over Arbor View, Valley and Basic. Bailey also made 21 tackles in that span for Boulder City. 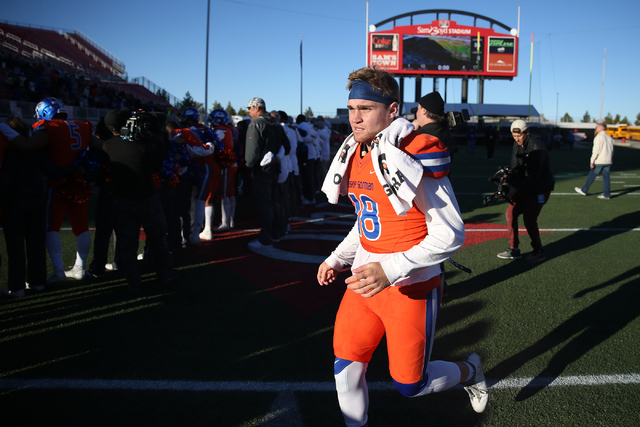 The senior quarterback accounted for five touchdowns in an 84-8 win over Liberty in the Class 4A state title game. Martell completed 6 of 7 passes for 127 yards and two TDs and carried the ball six times for 72 yards and three scores. The 195-pound sophomore helped the Bulldogs go 4-1 last week. In two victories against his opponent from Moapa Valley, he won by pin twice with a combined time of 54 seconds. ARBOR VIEW — Flag football player Melanie Ara rushed for 510 yards and seven TDs in five games. BONANZA — Boys basketball player Brandon Noone had a total of 37 points in two games. CENTENNIAL — Girls basketball player Eboni Walker had 19 points and 14 rebounds in a 67-42 win over Our Lady of Good Counsel (Maryland) in the Art Turner Memorial in Fairfax, Virginia. Boys basketball player Troy Brown scored 26 points in a 70-55 win over Knight (California) in the Legacy Tip-Off Classic. CHAPARRAL — Boys bowler Cerell Cardines posted a 234 average in three matches. Flag football player Naja Muhammed rushed for 219 yards and a touchdown in a 19-7 win over Eldorado. CIMARRON-MEMORIAL — Flag football quarterback Tiarra Del Rosario completed 23 of 29 passes for 399 yards and six TDs and rushed for a score in wins over Sunrise Mountain and Durango. Boys basketball player De’Marcco Alexander had a total of 58 points and 15 rebounds in three games. CORONADO — Girls basketball player Payton Caci had 14 points, eight rebounds, five steals and two assists in a 55-34 win over Durango. FAITH LUTHERAN — Boys basketball player Nic Maccioni averaged 20 points and 11.5 rebounds in two games. GREEN VALLEY — Flag football player Deborah Grant rushed for 177 yards on 14 carries in a 25-18 win over Las Vegas. LEGACY — Girls basketball player TaEha Pankey scored 29 points in a 67-35 win over Cheyenne. MOJAVE — Flag football player Anahi Rosales rushed for four touchdowns and had 10 tackles and four sacks in a 26-20 victory over Spring Valley. PAHRUMP VALLEY — Girls basketball player Isabelle Meza averaged 8.1 points and 5.3 rebounds and led the Trojans to a fourth-place finish in the River Valley (Arizona) Shootout. SIERRA VISTA — Boys basketball player Maka Ellis had a total of 45 points in two games.